Peyton Manning versus Richard Sherman will get top billing. Manning versus Russell Wilson will get plenty of attention as well. Next, might be the return of Percy Harvin. All are fascinating and deserving story lines, but they also may be less important in determining the outcome of this game than Marshawn Lynch versus the Broncos defense, and Knowshon Moreno versus the Seahawks. Seattle is a team built to run the ball. They have also become an increasingly difficult team to run against over the last half of the season, unless you are a running quarterback. Denver has not faced a team like that all season, and there is some reason to believe that could be a problem for them. Eight teams have eclipsed the 100-yard rushing mark in Denver’s 18 games this season. The Broncos are 5-3 in those games. Opponents that rushed for over 100 yards averaged 6.5 more points per game than opponents who did not. Seattle has rushed for less than 100 yards just four times in their 18 games. The Broncos have faced some good run offenses. Four of their opponents ranked in the top ten in rushing yards per game (PHI, WAS, NE, KC). They played New England twice and the Chiefs twice. Five of those six games resulted in the Broncos surrendering over 100 yards rushing. The good news for the Broncos is the first top ten rushing offense that they held under 100 yards rushing was last week versus the Patriots. Flipping to the other side of the ball, the Broncos have been held under 100 yards rushing only four times all year. They are 2-2 in those games. Their two wins were by 8 points in San Diego and in the season opener versus Baltimore where they trailed at home heading into halftime before blowing the game open. In other words, these were not their most comfortable games. They have played exactly one game against a top ten rushing defense (PHI). That game occurred in week four. That means it has been roughly four months since the last time they went up against defense close to what Seattle will bring to the table against the rush. The Eagles were ranked 10th to end the year where Seattle ranked 7th, but the Eagles were 18th in the NFL in rush defense when they played the Broncos. It would not be hard to argue the Broncos have not played a rush defense that is at all comparable to what the Seahawks will feature. Things get bleak for Denver when their opponent breaks the 100-yard rushing mark and they fail to reach the century mark themselves. It has happened three times this season, and the Broncos are 1-2 in those games. The third game was the 28-20 win over the Chargers, so not exactly a blowout. The Broncos defense finished tied with the Seahawks in rush defense at seventh, but they were 20th against the run over the last half of the season. Kevin Vickerson was a big loss, as was Von Miller. Seattle has played four of their last six games against top nine rush defenses, and three of six against top four rush defenses. They have gone over 100 yards rushing in five of those six games. They went 6-2 overall against top ten rush defenses. In the four games this season where they were held under 100 yards, they went 3-1. There were eleven games when opponents rushed for over 100 yards, and the Seahawks went 8-3 in those games. The Broncos rank 15th in the NFL in rushing yards per game. 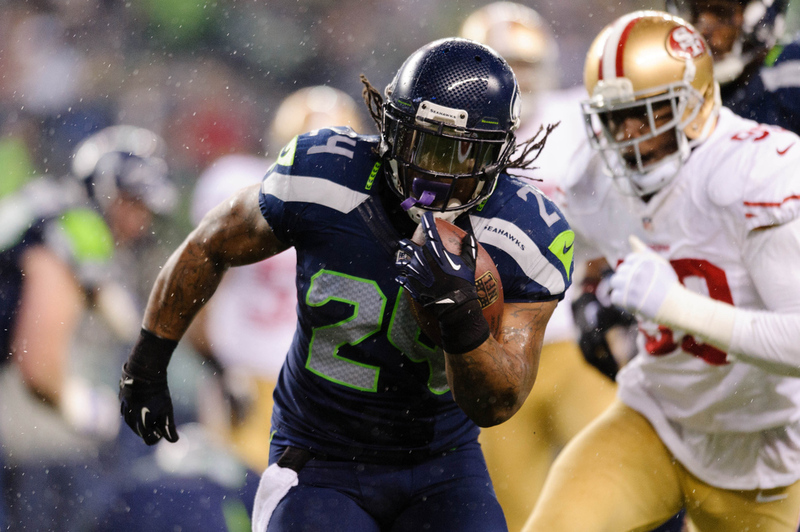 The Seahawks have played five games against teams in the top fifteen in rushing yards and are 4-1 in those contests. Even in games where Seahawks opponents have gone over 100 yards rushing and the Seahawks have failed to, the Seahawks are 3-1 this year. When the Seahawks do get over 100 yards on the ground, they are 12-2. Get up to 120 yards rushing and they are 10-1. All these numbers add up to tell a story. Denver is more reliant on success defending the run and gaining yards rushing than most realize. They also have not faced a rush defense like the one coming their way. Seattle has faced tougher rush defenses, and many of them recently (as in last week), and has been still finding yards on the ground. They have also been facing better rush offenses than Denver and holding them to microscopic rush totals. Sprinters sometimes train with parachutes tied to their backs. Seattle has had one, and is about to take it off. Denver has been without one, and is about to have one tied on. Advantage Seattle.